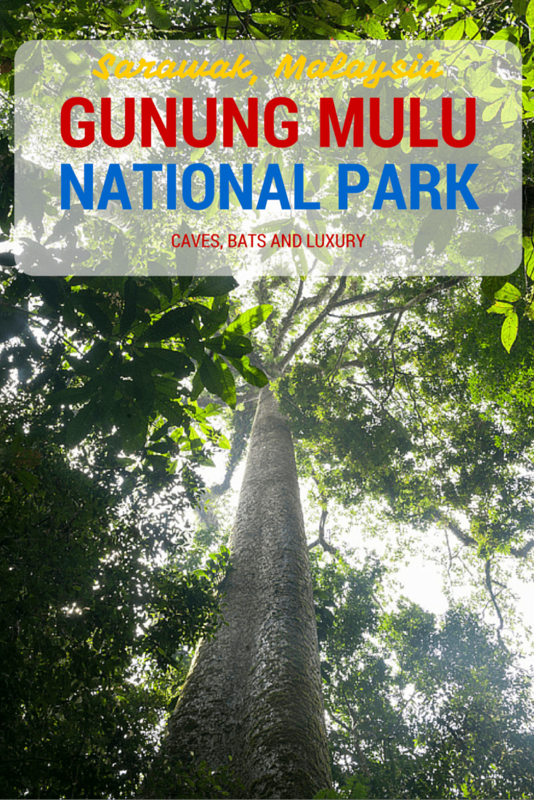 After our kayaking adventure in Borneo, we visited Gunung Mulu National Park in Sarawak, Malaysian Borneo, a place that had been on our wish list since our trip to Sabah in 2010. Follow us as we discover amazing caves, bat colonies and the world’s longest treetop walk, before ending the day in luxury! We were sitting on a platform, looking at the mountain in front of us. We could see a limestone rock face, surrounded by rainforest. The setting sun painted the sky and the rock orange, then pink, then lilac. Meanwhile, we just sat and waited. ‘We don’t know what time they’ll come, exactly’ said our guide Christopher. ‘Usually it’s between 5 and 6 pm. But it could be earlier, or later. This is nature, after all’. Just as he finished the sentence, something appeared. At first, it looked like a thin wisp of smoke, billowing into the sky in a spiral formation. But it wasn’t smoke – it was bats. Millions of them, in fact. Another spiral flew into the sky. And another. 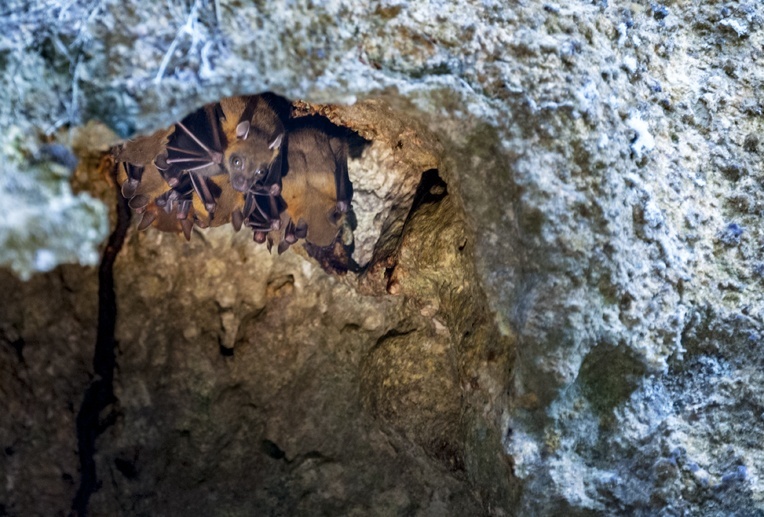 And another – we sat in front of the cave for 45 minutes, and every few minutes a swarm of bats flew out of the cave. 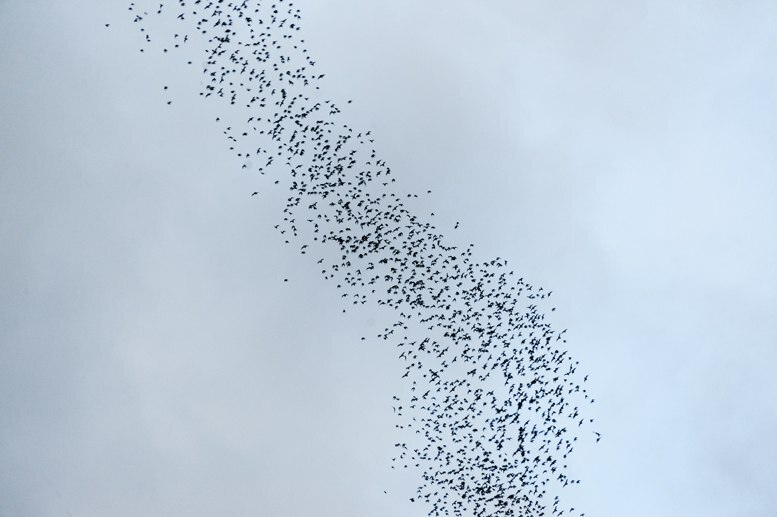 ‘Every swarm is made up of bats from the same species’ Christopher explained. ‘We have 27 of them, here in the park’. 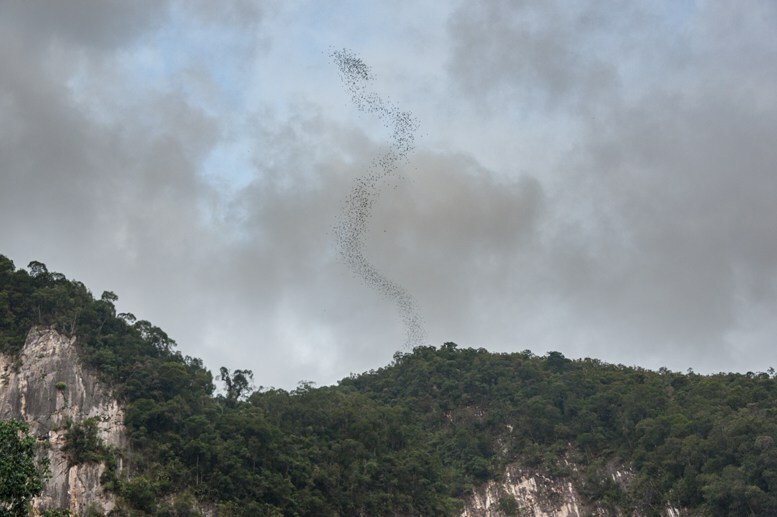 Some of the swarms were small, others huge, spiralling and spiralling upwards then across the forest, looking for fruit and insects to feed on. They would return to their cave at dawn, going to sleep just when the sun comes up, and the National Park goes back to life. 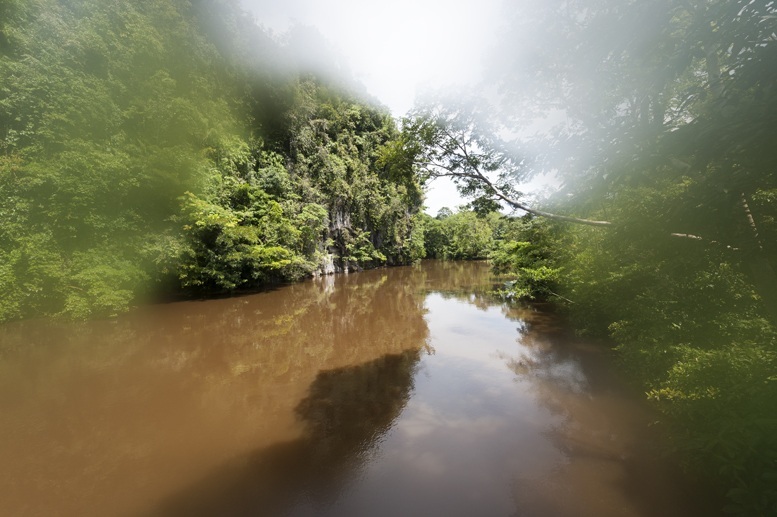 We were in Gunung Mulu, a national park in the Malaysian Borneo state of Sarawak. We had landed that morning, after having travelled from Kuching on a tiny ATR 72. As the plane came into landing, we could see nothing but forest. Blue-green trees, as far as the eye could see, with caffelatte-coloured rivers snaking across the expanse. I almost thought we would be landing on top of a tree, when the tiniest landing strip I had ever seen appeared. 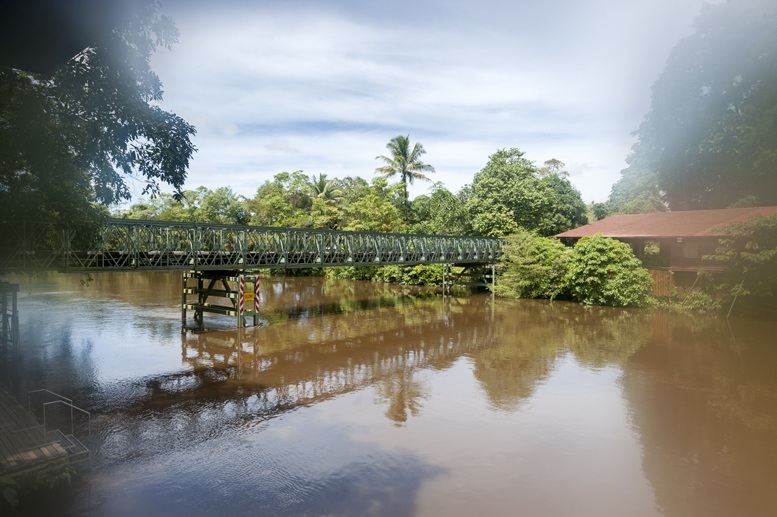 Outside the airport was a road connecting the airport to the Mulu Marriott Resort and the national park headquarters – the road itself was only just over 5 km long. All around it there was just forest, mountains, and caves. Wilderness reigned supreme. 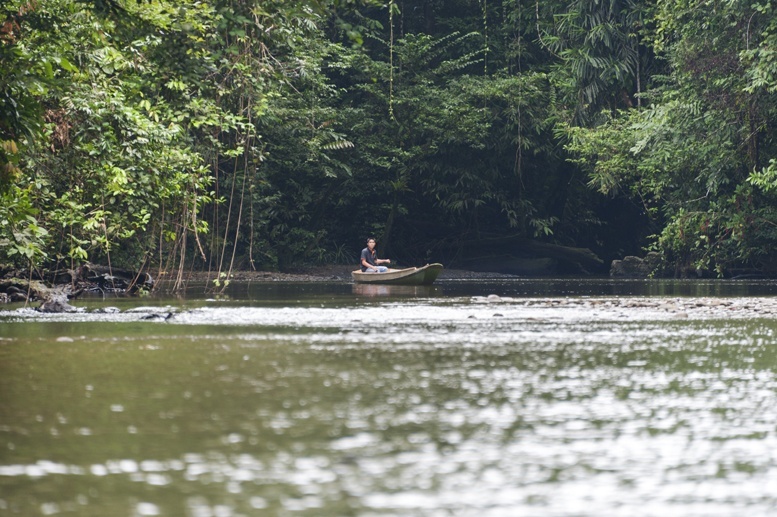 If you don’t want to fly, the only other way to reach Mulu is via long boat or truck – but it takes days and there’s no scheduled transport. You just need to try your luck, like the explorers of yesteryear. 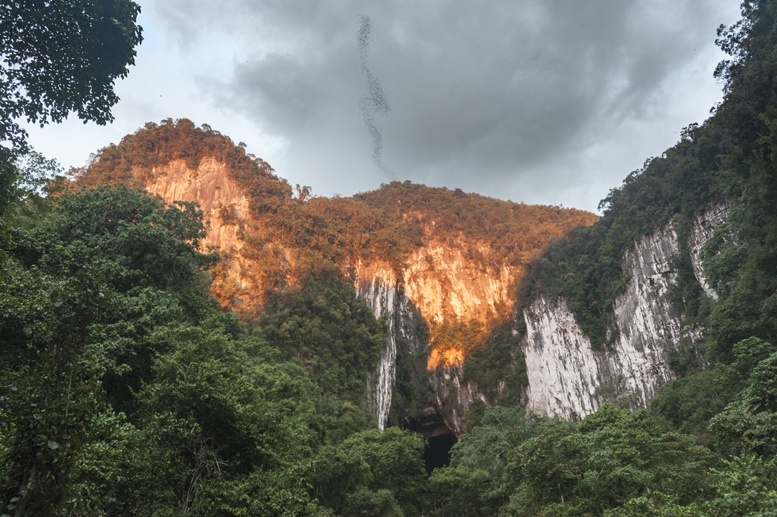 The main drawcard of Gunung Mulu National Park are its caves. 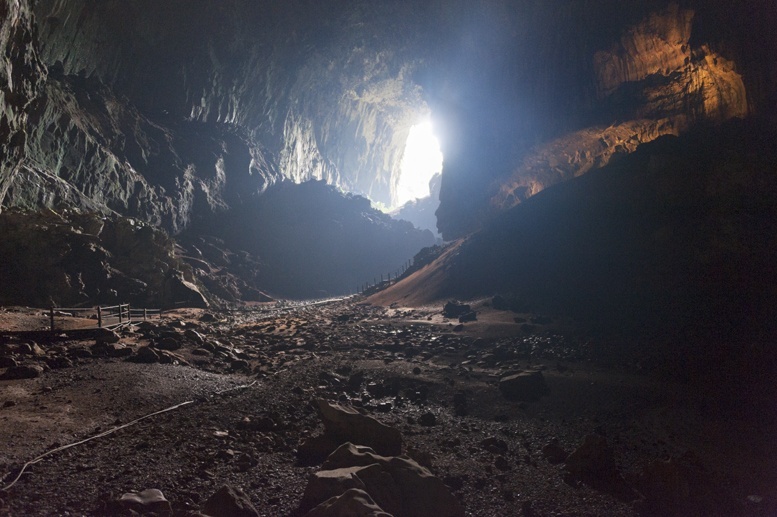 The park contains the Sarawak Chamber, the world’s largest cave chamber – so big that it can fit 40 Boeing 747, and two St Paul’s Cathedrals. 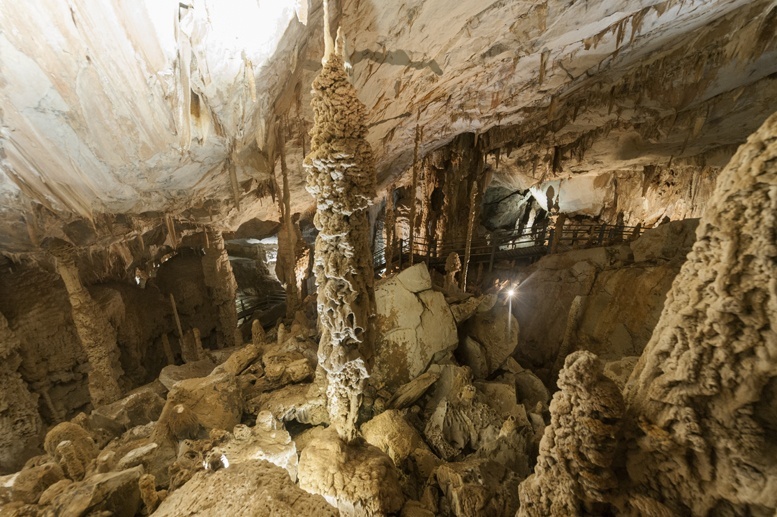 There are also several ‘adventure caves’, to be explored with hard hats, ropes and lights, and four easily accessible caves – which still need to be visited with guides, but don’t require crawling on your belly for hours on end. 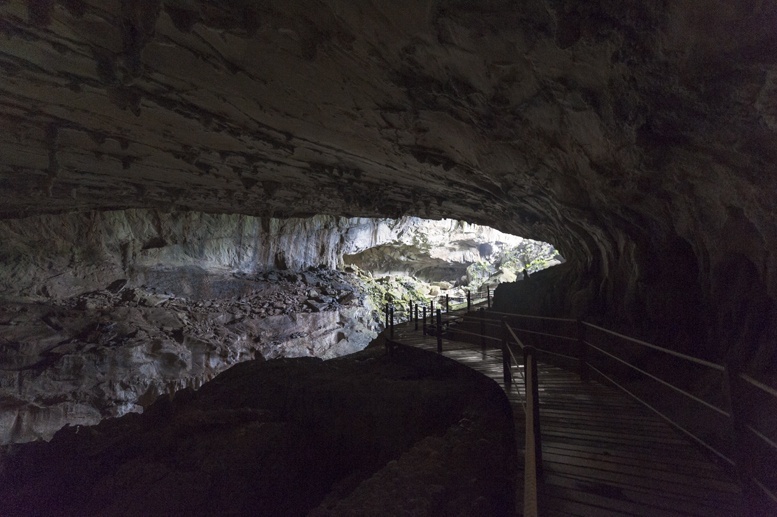 One of them is Deer Cave, home to millions of bats, and location of the amazing ‘bat exodus’ we had visited during our first day in the park. 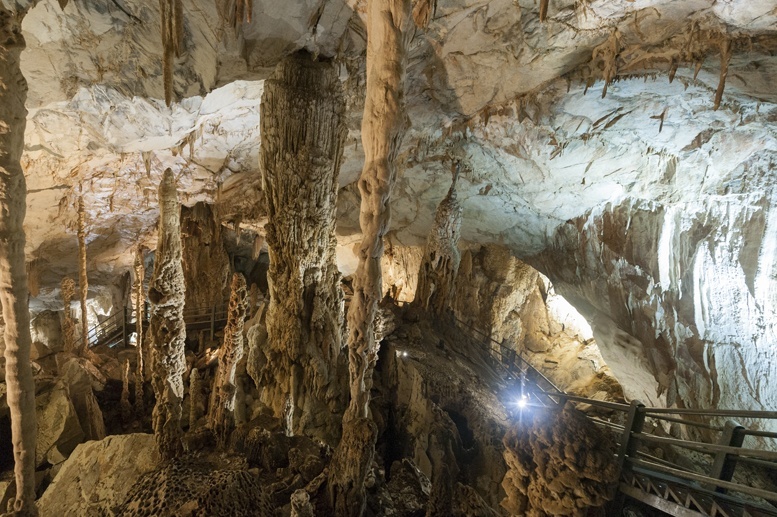 It also contains the world’s second largest cave passage – 169 meters wide and 125 meters high. 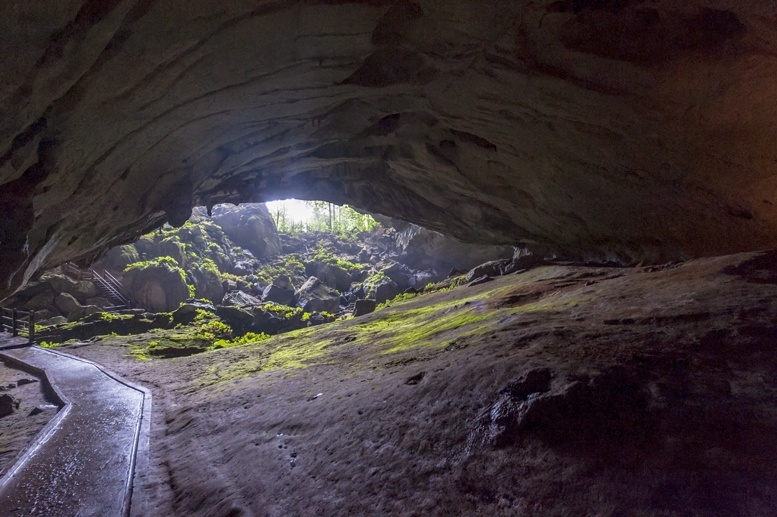 If you’re worried about visiting caves because of claustrophobia, Deer Cave will not scare you at all. The place is HUGE. The ceiling is so high, it’s hard to make out where it ends. It reminded me of the Mines of Moria from Lord of the Rings – I half expected hearing the bang of drums, before a thousand Orcs came out of the darkness to attack. Yet, despite its millions of resident bats, Deer Cave was surprisingly quiet. But it did smell. The floors were covered with mountains of guano, literally meters high. Being a national park, it’s forbidden to harvest guano from the cave – which lends it, let’s say, a peculiar smell – really strong and ammonia-like. ‘A Taiwanese lady fainted, once’ said Christopher. I doubted him not, and I made sure my scarf was firmly tied over my mouth and nose. From another angle – can you see the guano? When we reached a specific point, Christopher told us to turn around. 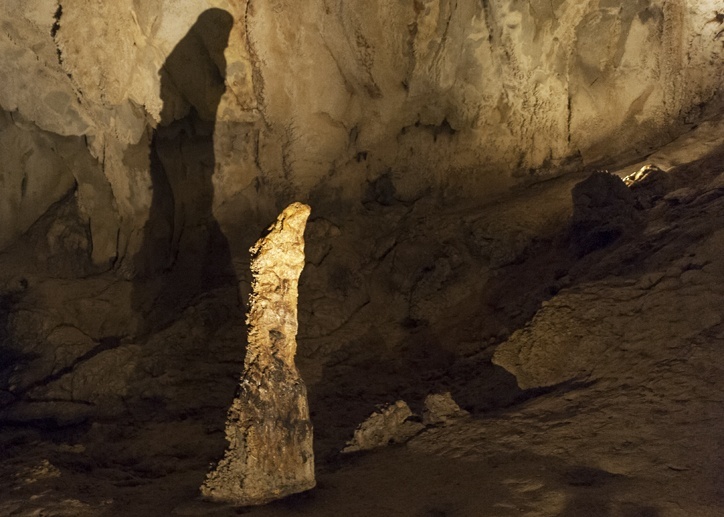 There it was – another of Deer Cave’s distinguishing features. 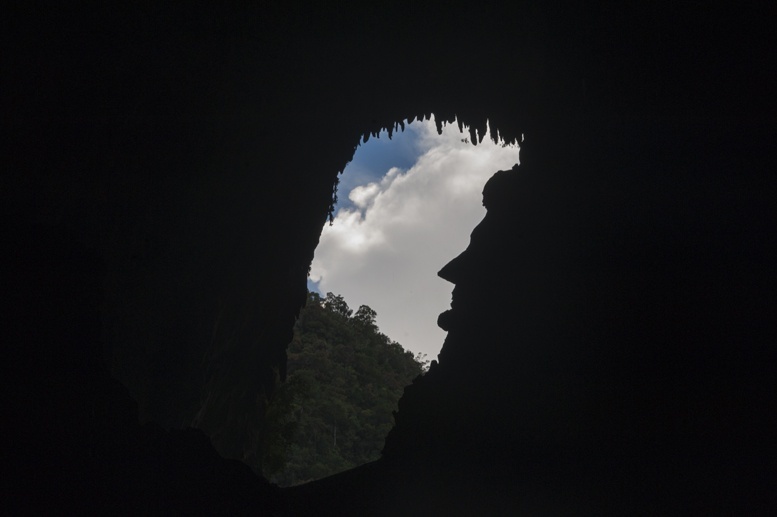 The rocks around the cave entrance shaped a very famous profile – can you guess who it is? We also visited Lang Cave, not far from Deer Cave, the smallest of the national caves in Gunung Mulu but also the one with the prettiest rock formations. 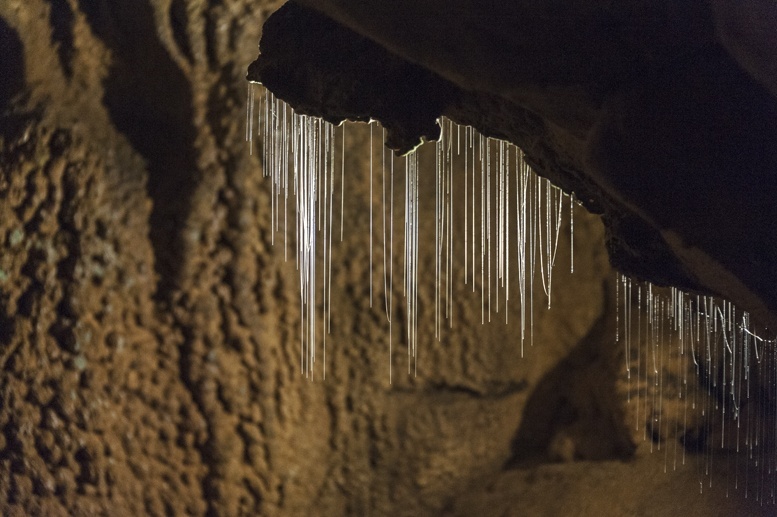 Deer Cave was just too big to appreciate the slow action of water on rock, sculpting waves on the ceiling, drawing stalagmites, columns and stalactites – some dainty, some huge – that we saw around Lang Cave. 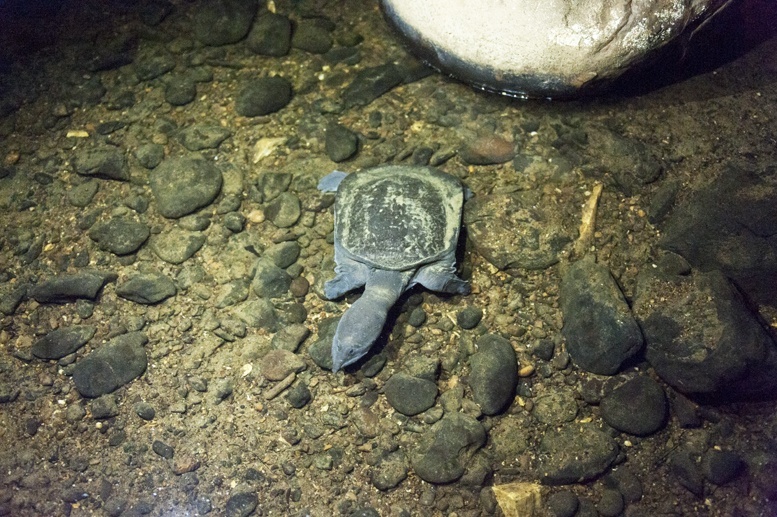 We also spotted a soft-shelled turtle, hiding under a rock in pool waiting for fish. Inside the cave something caught my attention. It looked like a row of cascading diamond beads, so thin they could only be manufactured by nature. What’s that, I wondered. I thought it may be the very beginning of a row of stalactites, or some other strange geological formation found in this mysterious, secret dark world. ‘That? It’s a worm trap’ said Christopher. 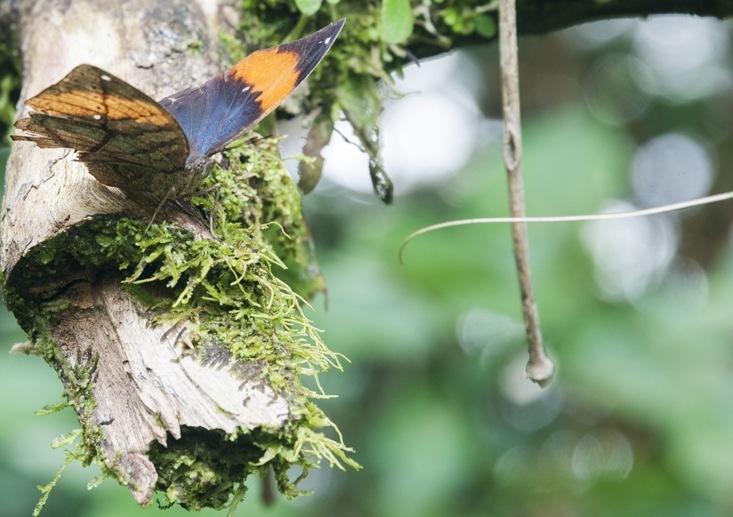 A trap set by cave worms, to catch small insects. The ‘diamond beads’ are made of a sticky substance, much like spiderwebs. I wonder how many more secrets caves conceal – and how many are yet undiscovered. 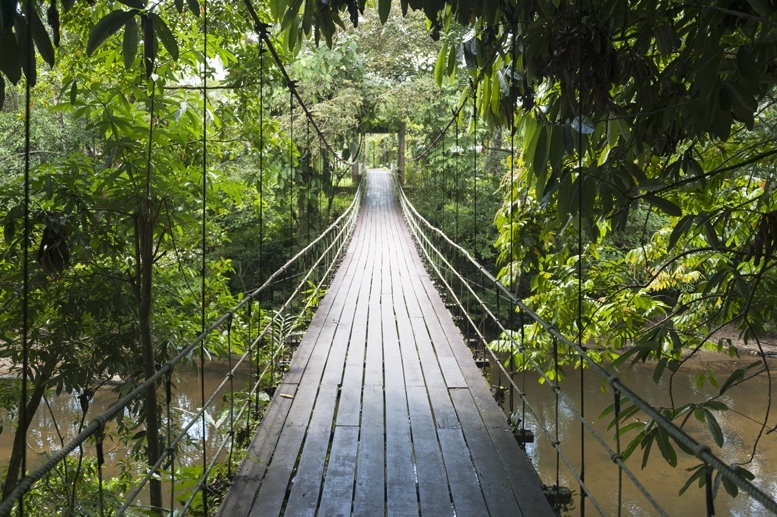 Deer Cave and Lang Cave are approximately 4 km walk from the headquarters of Gunung Mulu National Park, via a plank walk through the rainforest. 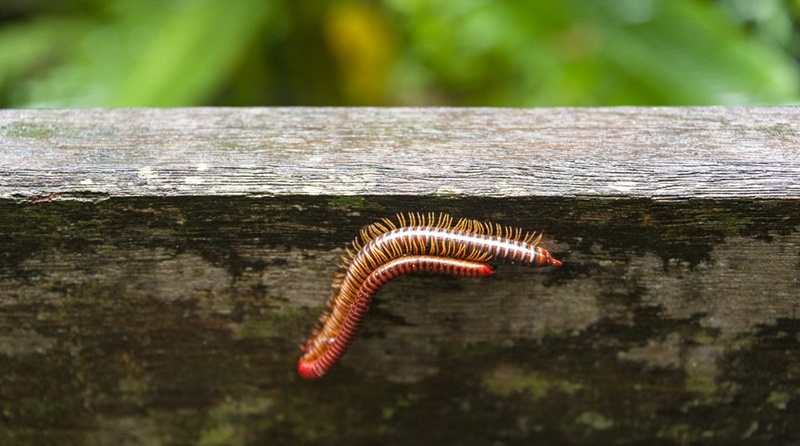 The walk itself offered great opportunities for wildlife-watching – small critters, colourful millipedes and stunning butterflies, snakes and lizards. ‘Watch out! Don’t touch the bannister’ warned Christopher, just as I was about to put my hand on an itchy caterpillar on the way back after the bat exodus. The following day, bright and early, we got on a longboat bound for two caves: Wind and Clearwater Cave. The caves can also be accessed via a long and strenuous hike – but wanting to save our strength for more sightseeing in the afternoon, we opted for the boat. We toured Wind Cave first. This cave gets its name from the wind that flows through it constantly, a nice break from the hot and steamy temperature of the jungle outside. 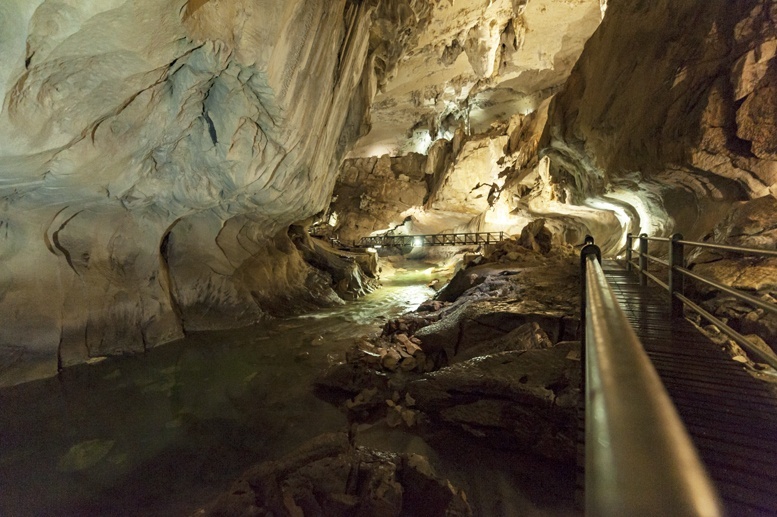 Wind Cave is also a good contender to Lang Cave for the award of best cave formations in Gunung Mulu. We saw pretty stalactites and stalagmites, and thin columns, stretching for dozens of meters. Yet, Clearwater Cave was the real star of the day. 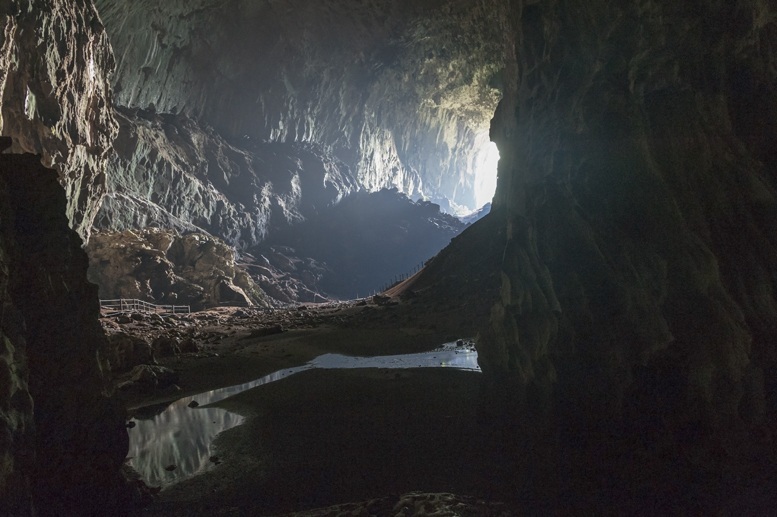 It’s believed to be the largest cave in South East Asia, and only a fraction of its 107 kilometers of chambers, tunnels and passages have been mapped and surveyed. The cave entrance was covered in bright green plants and shrubs, made even greener by the contrast with the bare rock. 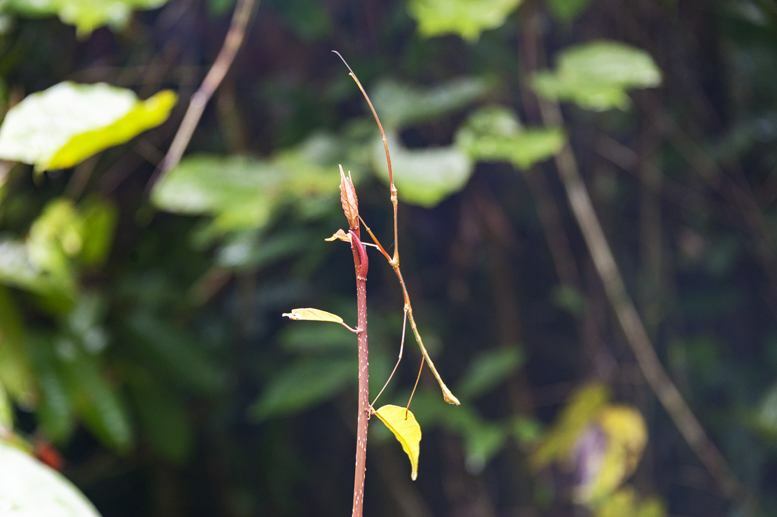 These plants are from the Monophyllaea genus, and they’re unique to Gunung Mulu national park. 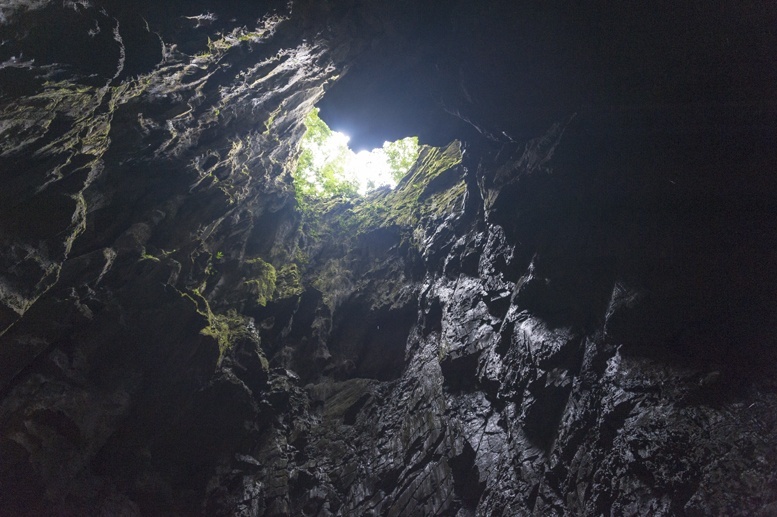 Soft-looking, downy moss grew into the cave, but only as far as natural light reached – beyond that, there was nothing but darkness, and the sound of rushing water. 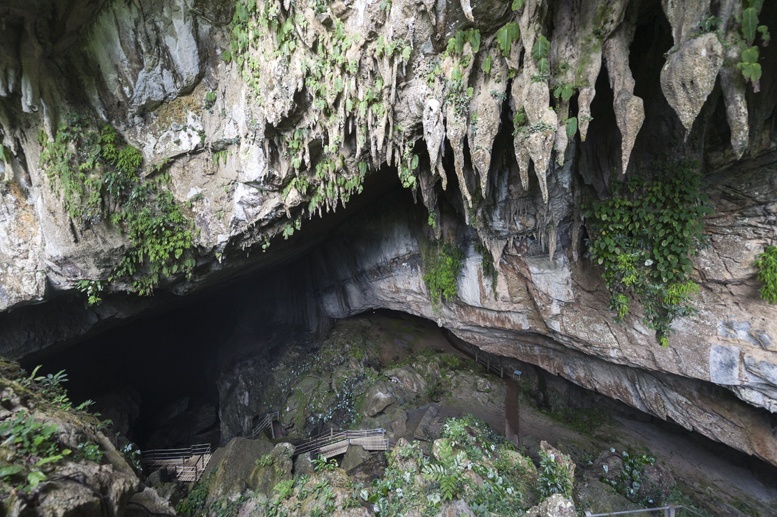 Clearwater Cave was shaped by an underground river that still flows in its bowels – the area around the river is lit, to allow visitors to appreciate the beautiful wavy shape of the cave tunnel, with an azure hue that made it look like marble. It was the cave where the action of water on rock was most clearly seen. 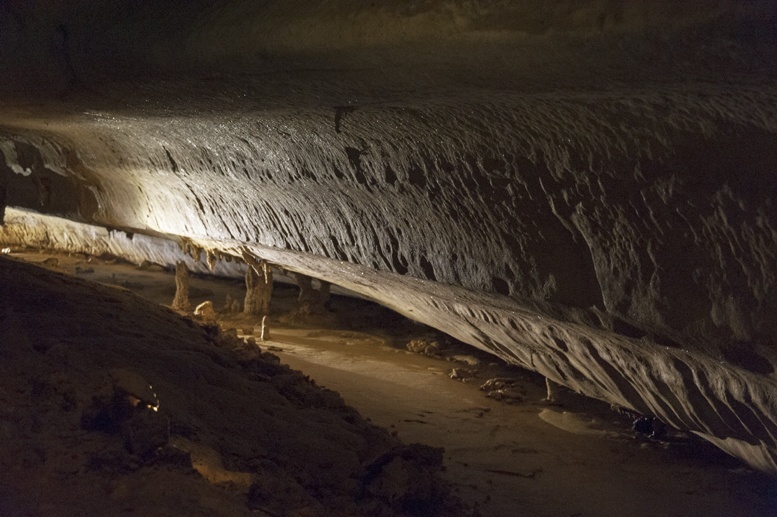 Christopher pointed our attention to scalloped ridges on the cave ceiling – the smaller the ridges, the faster the water was flowing when the cave was created. 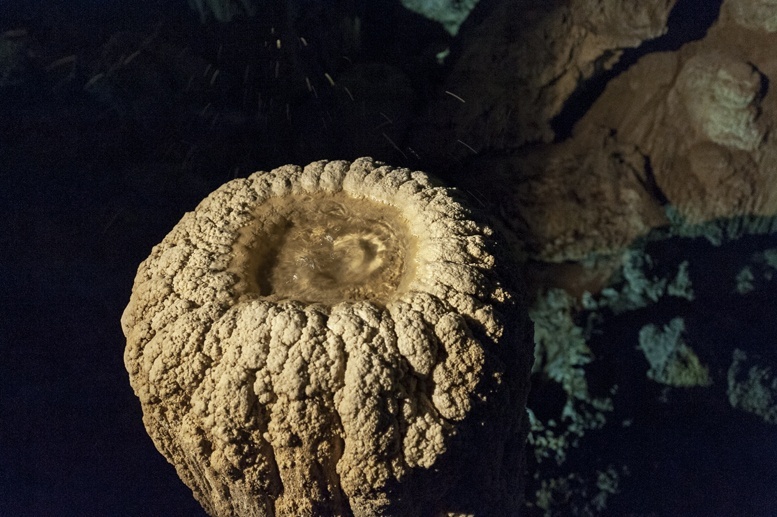 Then we saw more stalactites and stalagmites, and some cactus-like formations – old stalagmites, slowly being eroded again. If you do like we did, and visit Lang and Deer Cave on one day, and Clearwater and Wind cave on another in the morning, you’ll find yourself with an afternoon to spare. So, what to do? 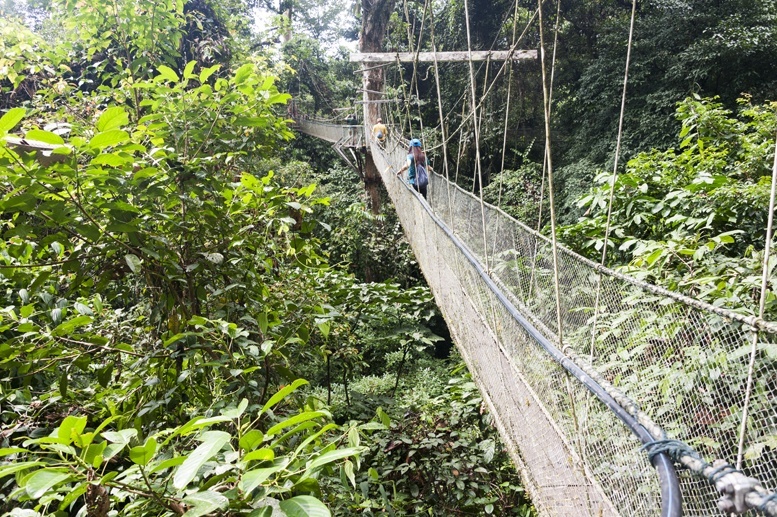 You can opt for an ‘adventure cave’ expedition, or choose to visit Gunung Mulu’s Canopy Skywalk for something more subdued. 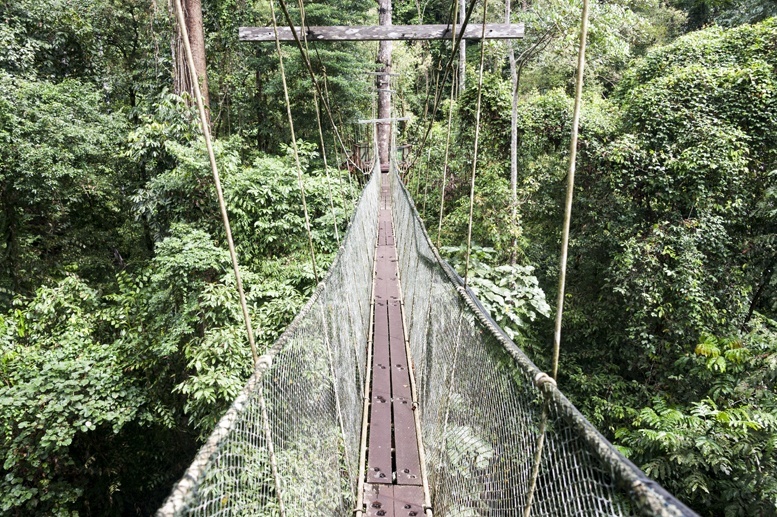 The ‘Skywalk’ also happens to be the world’s longest tree-based treetop walk, with 14 hanging bridges between trees for a total length of 490 meters. There are longer walkways, some of them hanging over a river, that will sway and vibrate as you make your way across, one step after another. 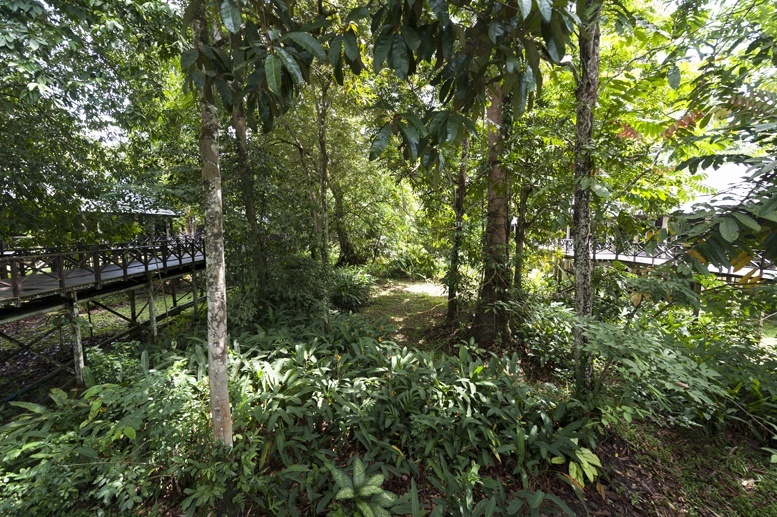 On the tree platforms connecting the skywalks, you are able to appreciate the forest from the point of view of birds and monkeys, and learn about the canopy and understory of the forest. We learnt that hornbills, the state bird of Sarawak (although we didn’t see any during our time in the state) are too heavy to fly in and out of the tangle of the canopy – this isn’t usually a problem as they’re very strong birds that can fly for long distances to look for the fruits that make up most of their diet. However, during breeding time, Mummy Hornbill cannot take her babies along – so she seals herself into a tree with mud, and relies on her mate to bring back food for her and the chicks. 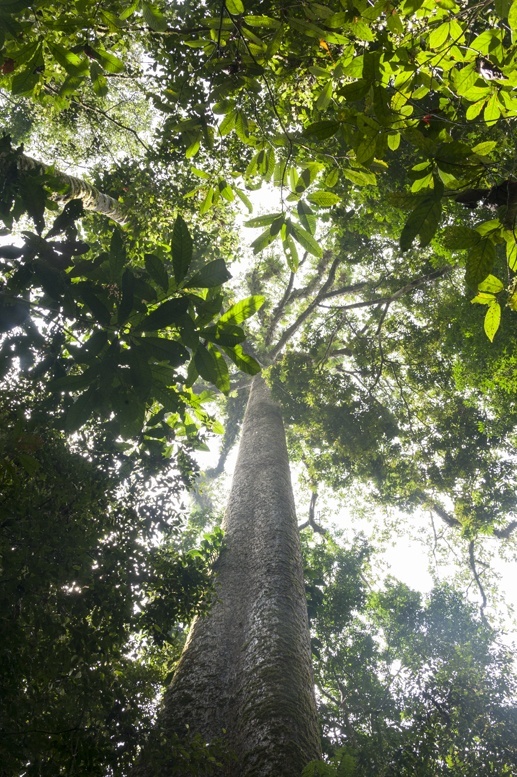 Just as you can’t see the sky from ‘ground level’ in the forest, you can’t see the forest floor from the canopy’s viewpoint. There are just trees, stretching in all directions, and limestone mountains. 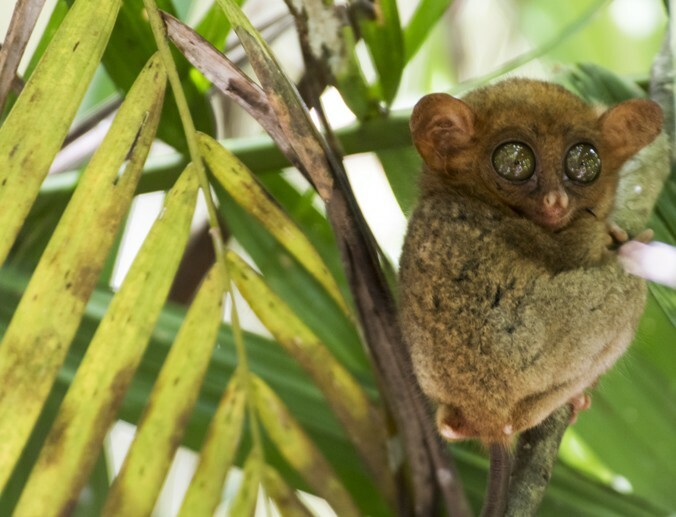 From the treetops, the forest looks neverending, boundless – but the real mysteries of Mulu are the ones that lie within, deep into the rocks. Mysteries that a two-day visit could barely uncover. The world of caves is one of the last frontiers of this planet – a fragile world of mysteries and magic, that conceals adventures we can’t even imagine. 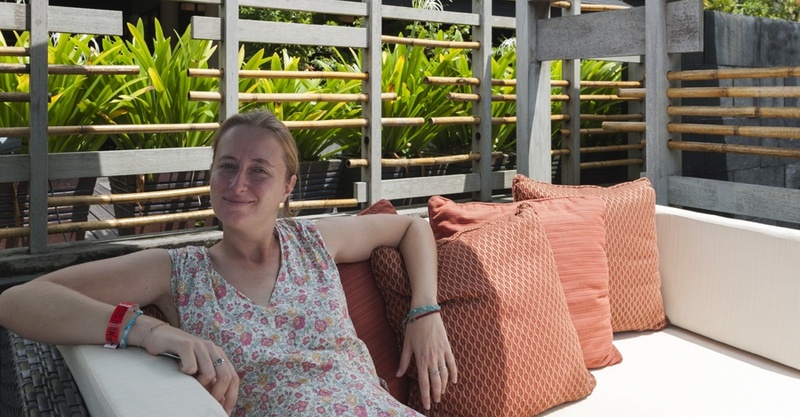 The Mulu Marriott Resort & Spa is pretty much the only accommodation option in Mulu, save for a handful of locally-run homestays and backpacker’s lodges. 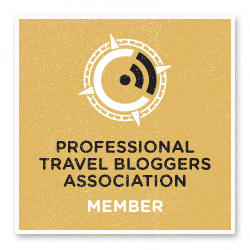 Being the only option for midrange and luxury travellers, I didn’t expect it to be great – after all, they have no one else to compete to. Oh, how wrong I was. The resort was absolutely stunning, a real oasis of peace and comfort in the heart of the forest. We were welcomed with a fresh juice and cool towels as soon as we got off our complimentary airport shuttle, and after a swift check-in we were guided to our cabin. 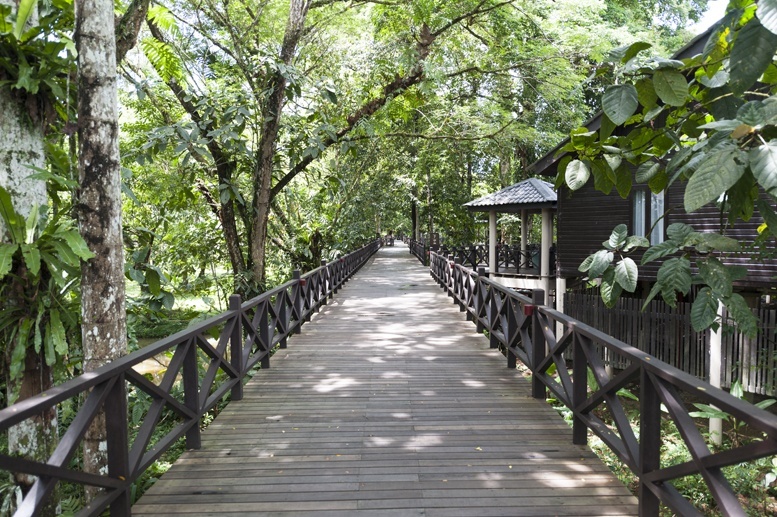 Accommodation at Mulu Marriott is in cabins on stilts, offering beautiful views on the jungle that surrounds the resort. And when I say cabins, don’t expect flimsy, drafty affairs – these are top-notch, luxury cabins, with a huge bathroom complete with bathtub and rain shower, a balcony and an aircon system that keeps temperatures constant at 23° even when guests are outside the rooms. And the beds. 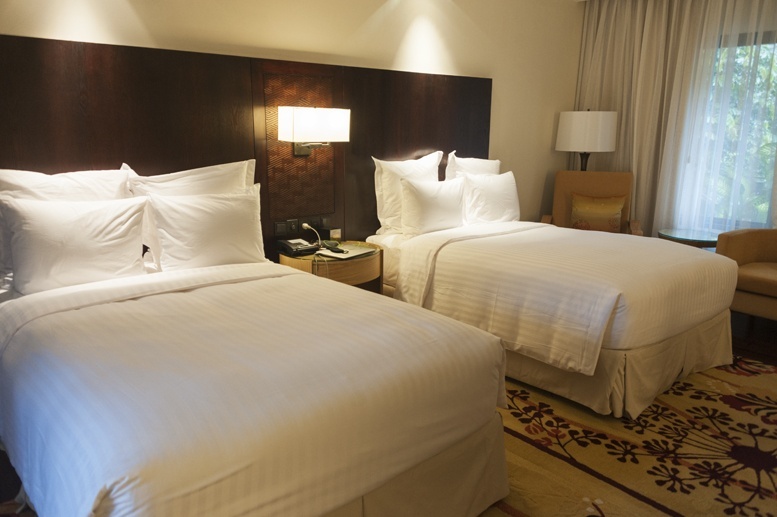 The beds at Mulu Marriott are absolutely, by far, the comfiest beds we’ve ever slept on. Lying on them was like being in the softest, fluffiest embrace, and no matter how tired and sore we were, we fell asleep instantly both nights and woke up rested and refreshed. 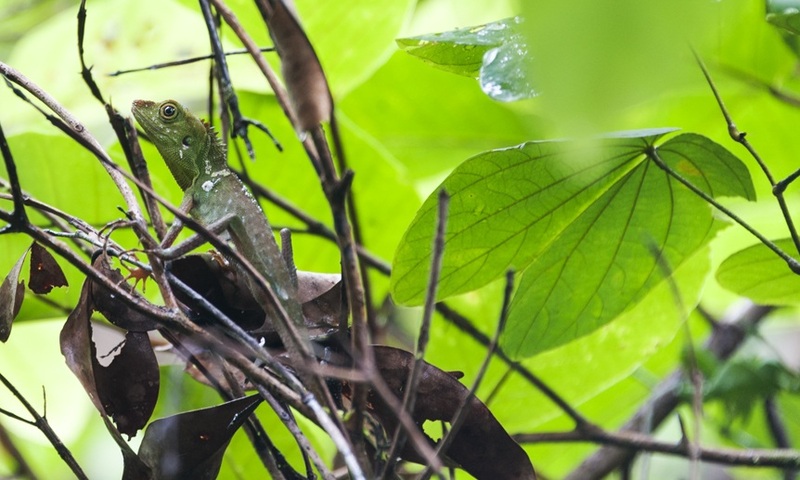 Food at Mulu Marriott was also of the highest quality – you wouldn’t believe we were in the middle of the jungle. The breakfast and dinner buffet offered Asian and Western favourites – from a nasi lemak station to a chef making omelettes and eggs on request at breakfast, a Caesar salad station and make your own noodles at dinner. While we were enjoying our breakfast by the poolside, a lady offered us a portion of sticky rice and sambal wrapped in banana leaves – truly delicious. Later that day, we met Grant, the general manager of the resort. 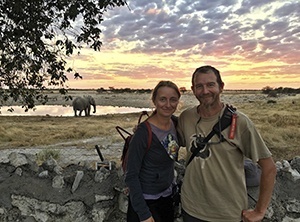 Grant explained that he’s trying to involve local people in the resort as much as possible – besides hiring them, he’s inviting local ladies to cook their specialties and offer them to guests at breakfast. That’s what the rice and sambal was! We thought it was a brilliant idea. More often than not, profit from tourism only benefits foreign investors while locals are being paid peanuts. 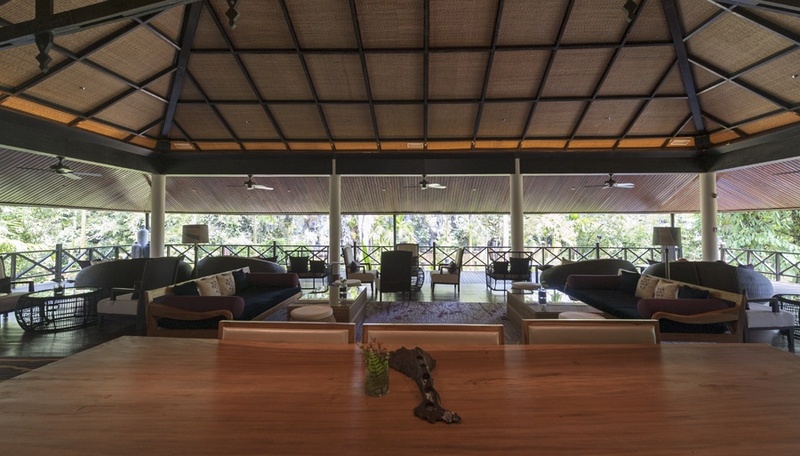 While at Mulu Marriott, Grant sounded really keen to help the local community as a whole – just another reason to choose to stay at this beautiful resort in the heart of the jungle. 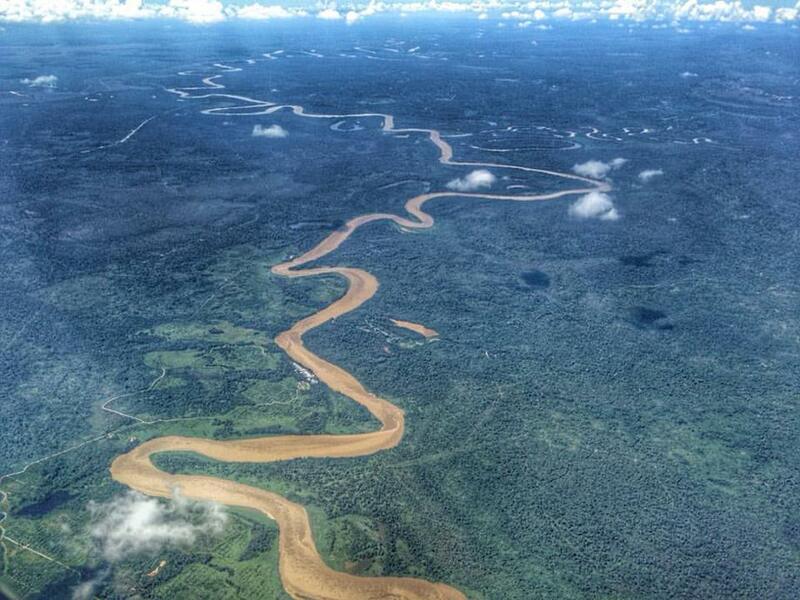 The best way to reach Mulu is by plane, from Kuching, Miri or Kota Kinabalu with Malaysian Airlines or MAS Wings. 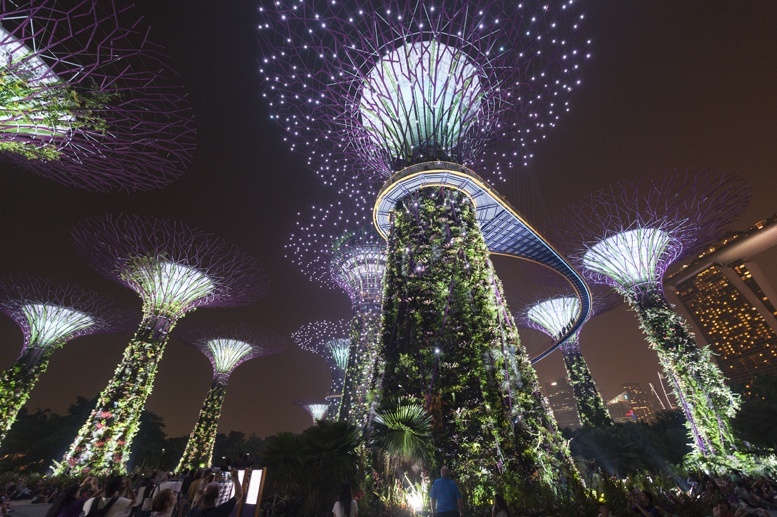 Book early to get good fares – it can be as cheap as 100 RM each way. If you’re visiting both Sabah and Sarawak, Mulu makes a good intermediate stop between Kuching/Miri and Kota Kinabalu. Entrance to the National Park costs RM 30 for non Malaysians, and is valid for 5 consecutive days. 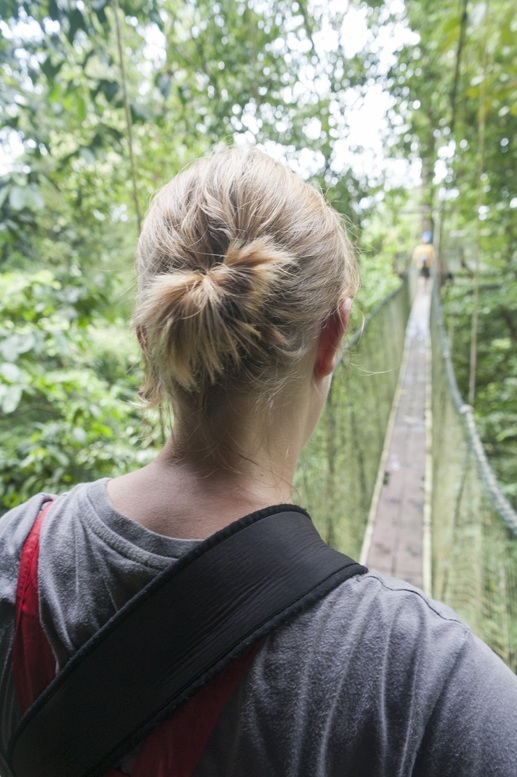 On top of that, you have to pay guide fees for all caves and for the Canopy Skywalk. We would like to thank Grant and Mulu Marriott for welcoming us for two nights, and the Sarawak Tourism Board for having arranged and sponsored our trip to Gunung Mulu National Park. Bats. I can take them from a VERY long distance. But not from up close as you got to see them. They scare the hell out of me. 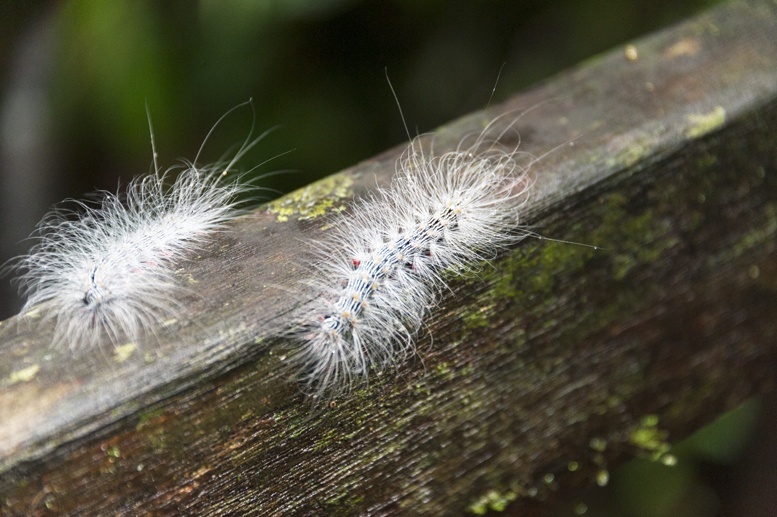 I have seen them in various sites around the world and the minute they start flying I start screaming, rushing out, hiding behind someone’s back. No way I can take them. Great post! We were in Borneo and missed out on going here. It is one of the top places (because of the caves) I have wanted to go since learning about them. Love all the photos and info! What a gorgeous park. It looks like there are many places to explore, great post. I love the photos – had to look it up, but I can definitely see the likeness of the silhouette to President Lincoln now. Nature can create some amazing things. Great post, enjoyed every bit from the caves, canopy walk and luxury. A destination that should be on my bucket list. sembra un posto davvero fantastico! che belle foto! what a amazing park ! it looking awesome and best place for adventuring. photos of this post are looking awesome. great park !